If you’re planning on having a natural birth especially in a hospital where the setting isn’t ideal and epidurals and other forms of pain-relieving drugs are readily available, it’s important that you plan for success ahead of time with more natural ways to manage labor pain. At first glance, these methods of relaxation may seem quite simple, but they are very safe and effective in encouraging a healthy and smooth physiological birth. Here are 9 things you can do during labor to help you relax and power through your beautiful natural birth. The environment that you’re in during labor, is very important and not only contributes to your state of relaxation throughout the birth, but also your overall birthing experience. 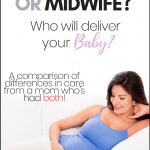 If you plan on having a natural hospital birth, making the birthing room “yours” is key. Birthing rooms in hospitals are generally, cold, clinical, and filled with machines. Bringing things to transform the space into one that you are comfortable is important. Blankets and pillows from home, battery operated candles, an essential oil diffuser, etc…Making small changes to your room can transform from a basic space into a birth sanctuary conducive to an amazing birthing experience. Breathing is key during labor. Doing it too quickly activates your body’s fight or flight response which triggers the production of adrenaline, which can slow or stall your labor. Breathing in a controlled manner is a powerful way to manage labor pain, as it allows your entire body to relax as you ride the waves of your contractions. It also encourages your body to produce labor hormone such as endorphins, to help you cope with the intensity of labor naturally. In my opinion, one of the things that plays a major role in actually going through with having a natural birth, is the mind. Once you’ve accepted the fact that you’re going to have a natural birth and that it does come with a certain degree of intensity, it’ll be much easier for you to let go and embrace the process, and just relax. Worrying and being stressed during labor takes a lot of mental energy which can negatively affect you physiologically. The more you look at that clock, the more you think about when it’s actually all going to be over, the more you’re stressed and on edge. Relax and conserve that mental energy and channel it towards birthing that baby. Contrary to what is often shown on TV, laying down on your back during labor is actually detrimental your birthing experience. Moving around during labor is a very effective natural way of relaxing and coping with labor pain. Whether it’s swaying your hips, leaning over your spouse or doula, being on all-fours, or even hoping into the shower, these are great ways to manage pain during labor and to help your baby further descend into your birth canal. Need some extra help managing labor? Hire a doula! Doula’s -like myself 😉- are great assets to have as a part of your birth team. Aside from providing pregnant women with informational and emotional support during pregancy, they also provide physical support which is crucial during labor. From rebozo sifting to double-hip squeezes, doulas can suggest various methods of relaxation that can help you better manage labor pain naturally. Studies have found that women who are supported by doulas during labor have better birth outcomes. Digging deep and finding your voice during those powerful surges is a very effective way to relax during labor. Vocalizing in deeper tones is highly effective as opposed to screaming, which can make you feel out of control and make it more challenging for you to relax and manage labor naturally. Counter-pressure during labor is an effective way to help you relax as it relieves labor pain. It’s usually applied in the small of the back, using the heel of a hand. Sometimes even tennis balls are used. Anything that is smooth with a curve can be used to apply this pain-relieving pressure. If your birth partner gets tired (it can be very hard on the arms! ), perhaps a nurse can assist you, or you can even do it yourself. If you have a tennis ball you can place it right between you and a wall and push your lower back into it during contractions. Visualizing yourself holding your precious bundle of joy can really help you embrace the process and power your way through natural birth. Keeping negative thoughts out of your mind and focusing on the bigger picture will also help open up your body physiologically by encouraging the production of all the necessary labor hormones needed to provide you with a smooth delivery. Taking it one contraction at a time is important, but when you find yourself needing a boost of confidence and energy to pull through, visualize your end goal. I hope you found these pain managing techniques to be helpful! 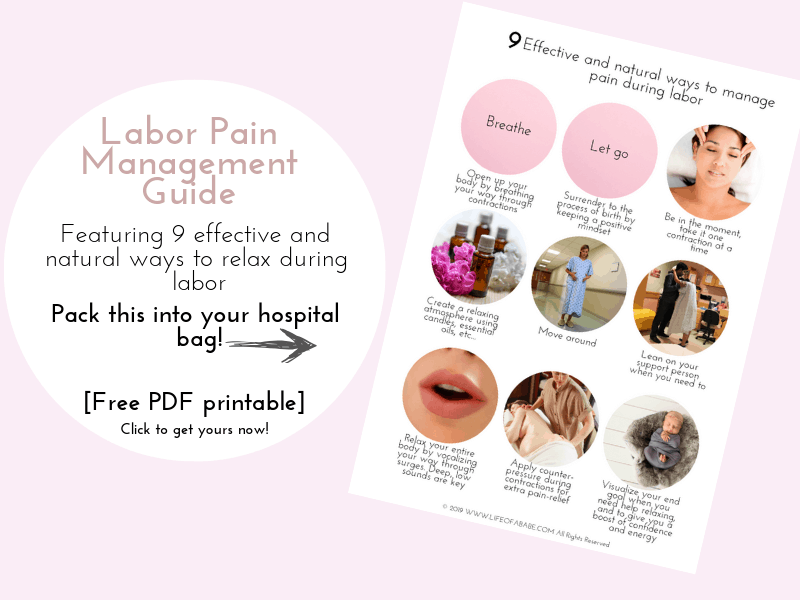 What is your favorite natural pain relieving technique for labor? I had a scheduled c-section for multiple reasons but these tips for a natural birth would have been ideal. I like the hospital bag tip sheet. What a great idea! These are very good advises. I was in labor for 15 hours with no pain medicine. Trying different positions, meditation and moving in circles while seated helped me a lot too! 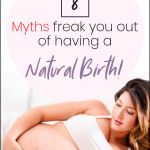 I wasn’t in a position to have a natural birth, but some of the tips you mention can still be helpful to someone like me! Great tips! With my second and third child I felt labor was pretty tolerable. With my first I was in so much pain!!!! Wish I had this then! Visualization, breathing, and pressure to my lower back helped with my first birth. I’m currently 35 weeks and plan on another unmedicated birth. This time I want to stay of my feet longer (my nurse insisted I lay with my first birth), use a birthing ball, stay on all fours, essential oils, and possibly bringing a tennis ball to help with the lower back pain. I love all these tips!!! 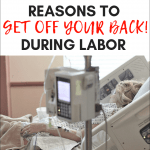 I ended up getting an epidural during my labor, but breathing deeply and focusing on one contraction at a time really helped me prior to that. I had a c-section but imagine I would have been implementing some of these tips if i had a natural birth. Love this. If only I did this! Haha no but seriously. I never thought about movement until the nurse with my second one gave me a medicine ball to bounce on. Oh my goodness did it help so much! Great tips. I pretty much save all your blogs because IF I have another child I plan to do it naturally this time. You give really insightful information. Thanks! These tactics definitely helped me get farther into labor than I did last time. You are so strong to push through the entire thing naturally. I was a little disappointed I couldn’t make it through, but as a mom I know I did the best I could do and all that matters is that he is healthy. Mamas just know you aren’t failing because you got meds or didn’t get meds! We’ve got this!